We get hundreds of completely unsolicited e-mails, notes, and letters each year from attendees telling us how our programs have transformed lives, careers, and relationships. The vast majority of students who attend our programs give them the highest rating on the evaluation form. Here, in their own words, is a small sample. Hi Jim: Just thought I would drop you a note to let you know about a success story I just had that I can say was a direct result of your class I took at PCBS last summer. I just negotiated the terms of a covenant waiver with a troublesome client. Using the techniques I learned in your class (envelopes, krunching, make me an offer, nibbling) I obtained a very favorable result and felt like a negotiating pro. This feels GREAT! I know it sounds like a cheesy infomercial endorsement, but it's the truth! Thanks! I am the CEO of Kora-Angola, a company that builds new cities of affordable housing in Sub-Saharan Africa. We deal with mega projects and build houses for hundreds of thousands of African people. 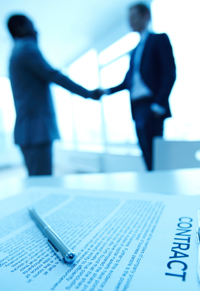 As you can imagine, we deal with hundreds of suppliers, contractors and different stakeholders. Negotiation is one of our core activities. I wanted to write to thank you for your book. Unlike most of the books and guides on the subject, your book is clear, well explained, makes so much sense and most importantly upgrades the reader's negotiation skills and understanding significantly. For a year now, every new on-boarding senior manager in our company gets a copy of your book. We all find it very relevant even in this highly multi-cultural environment. "WOW! What a phenomenal program!" "Jim brings a wealth of wisdom, experience, and integrity to his work. He has helped me excel in my career and has had a significant impact on my personal and professional development. Jim has my highest recommendation." "Negotiate to WIN provided the most usable information I've ever gotten in a workshop of any kind." "Jim: You were a pivotal reason for the successful negotiation on the international treaty. The groups could not have done it without you. You should be incredibly proud. Hats off to you for your amazing work and skill! We are lucky to have you as part of our community!" "I should have taken this course years ago." "Mr. Thomas took the time to research our industry and our company. He customized the training to our needs. The program far exceeded my most optimistic expectations." "Jim's energy and enthusiasm are simply incredible. You can't help but learn." "[A colleague] continues to rave about the talk you gave. This led to his taking your seminar, which led to his substantially increasing his income." "Jim Thomas was awesome—he is a former INF negotiator and also participated in the START talks, so it was similar to watching Michael Jordan play basketball." "Jim is quick-witted, humorous, and fun. His workshop is lively, informative, and relevant." 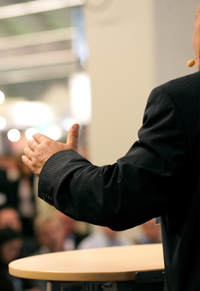 "I highly recommend this seminar to any businessperson who wants the edge." " Negotiate to WIN was excellent. It provided solid, practical knowledge that we can truly use in our day-to-day selling. The feedback from my team has been overwhelmingly positive. I would strongly suggest this course for all field sales people. Mr. Thomas is an accomplished instructor with a special way of sharing knowledge. He shows you how to handle the stressful and complicated business of negotiating. The knowledge is already in use... A salesperson got a full-truck order from a customer yesterday (after they only wanted to share trucks). Plus, [a salesperson] closed a large customer and negotiated a full-truck order. We appreciate the opportunity to attend this very useful course." "Very professionally presented ...An amazing amount of useful information in a very short time." "Your training class was superb...The tools and action steps you provided should enable everyone to improve their negotiating skills." "I hope our customers don't take this training!" "Jim's wisdom and energy touched all of us. It was a uniquely beneficial experience for everyone fortunate enough to be in the audience." "Jim: Thanks again for a really enlightening class on negotiating. People in my office loved it. There is absolutely no question that your techniques are already being employed in my world. Your class will be HIGHLY recommended to my colleagues." "The best seminar I've ever attended!" "Jim gives you the tools you need and shows you how to use them." "Jim: I ran into a colleague this morning and she was extremely delighted with your session. Speaking of results, I just bought a three year old [automobile] from a dealer. After many trips to his manager, the salesman got approval for the price we wanted. I whispered 'Thank you, Jim'!" "I was astonished at how quickly I found myself using the knowledge conveyed so efficiently and effectively." "I've already negotiated with her on two points and, next week, we're negotiating with a client who disagrees with a past bill. My business partner was surprised that I INSISTED on doing the negotiation. The course was invaluable!" "Even if you think you're a skilled negotiator—take this course!" 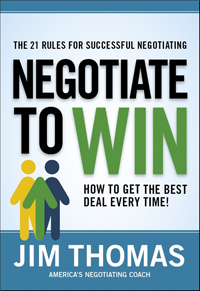 Jim's Negotiate To Win seminar is a must for everyone that uses negotiation in his/her profession! I currently work in private equity and am involved in complex negotiations on a regular basis. Jim's course has proved to be extremely helpful! I wish I would have take his course a lot earlier in my career!! Jim's exercises ensure that you not only improve your negotiation skills, but also have a chance to utilize his method in a real-life, practical scenario. I teach a university course on Private Equity and Venture, and used Jim's Venture Capital Negotiation Exercise in my class. The students really improved their understanding of what it takes to successfully negotiate a term sheet. The feedback from the students was overwhelmingly positive! What a great way learn! S.B., CFA, Mink Capital Inc.
"Jim is simply the best negotiating coach in the business--period! His course is transformational! I use his system every day, as do almost all of my companies. Every deal done at NGEN is negotiated on his platform. I would strongly recommend Jim's program as an essential course for your company!" "Jim's immersion approach to negotiating is superb! I had to instantly negotiate subjects that I had no prior familiarity with. 'This was 'frightening as hell!' -- until I realized that being out of my comfort zone was what enabled me to develop my negotiating skills. Within weeks of Jim's training, I applied his principles in my everyday work. And to my surprise, with great success!"